Hello my lovelies! Happy Sunday! 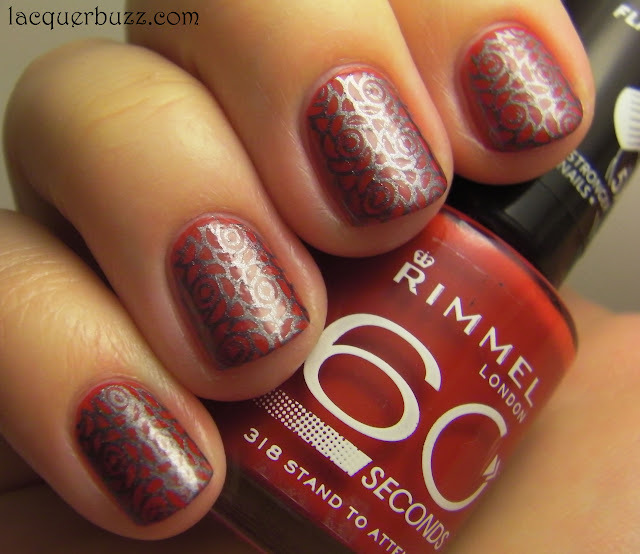 I have another stamping mani for you today. This week's challenge in the Adventures In Stamping group was "Your favorite new stamp". This one was really easy as we didn't have any restrictions regarding plate numbers, colors or anything. My newest plates are the ones from the first Cheeky set and even if I got them a couple of months ago, most of them are still covered with the plastic film. I really love flower stamps so I wanted to pick one from the unused stamps. Here's what I came up with! The base color is another color from the Rimmel 60 Seconds line. I still have a ton of these to show and I was thinking I could do a couple of posts with all the ones I have (9 at the moment). Let me know what you think! This is Stand To Attention, a cool toned red creme. Some of you might know that I don't own many reds because it's hard for me to find ones that look good on me. This one is a winner and although it came out a little warmer in the swatch picture, I can assure you it is cool-toned in reality. From all the 60 seconds colors I own, this one is the first that was actually a one coater (still have about 3 left to swatch though). What you see in the picture is one thicker coat, just because it has a thicker consistency that may create bubbles if you are not too careful. It dries fast to a shiny finish so there's no top coat in the picture. One thing I would like to mention is that cleanup for this polish is a nightmare from hell. Literally, that is what I wrote in my notebook when I swatched it. What I recommend is cleaning up immediately after you applied it. Don't let it dry or else it won't come off anymore! For the stamping I chose this rose pattern from plate CH6. It might not be very evident in the pictures but the lines form little rose shapes. I stamped with China Glaze Awaken from the Romantique collection, a dark silver foil that is great for stamping. I wish the pattern would be more clear in the pictures, as it was in reality. I really like this stamp and I'm gonna use it with other color combos. Maybe a bigger contrast between the base color and the stamping color would make it pop more. Thanks for stopping by and have a great Sunday! I really like this stamp too!!! I have a gazillion plates at home and they're all still sadly covered with foil... I'll have to change that for sure!! Very nice combo of the colors btw!! Thank you! I'm looking forward to your next stamping manicures!